One month into 2019 already? Yes, that really just happened! So if you’re feeling a little dazed, maybe you need to curl up on the couch and take a medicinal dose of Netflix goodness to sort you out! And you’re in luck – our friends at Netflix USA are serving up a fresh batch of streaming content to keep you entertained. Let’s take a look at the highlights for the month. For Australians (or non-USA residents really) that want to access the US version of Netflix, which has if not more content, then at least different content than the local version, the best way to do that is described in our updated guide here. Sure, there are other ways, cheaper ways, but none more reliable than what we have tested (and what we are actually using for ourselves). And sometimes the opposite is true, and if you're in the US, you might also want to check out some of the stuff in the Australian version that you won't get back home - our method works the other way too! And while Netflix's library is out of sync geographically, there are still a lot of the same additions regardless of where you are, especially when it comes to Netflix originals. And so this article focuses on content that you won't get in Australia or hasn't been covered by our 'Netflix Australia: What's New in February' article, and so a quick glance of that article is recommended as well. Keen to add some superhero action to your bingeing queue? Then you’ll want to check out ‘The Umbrella Academy.’ It’s a rather complex back story but the basic gist is that a disbanded group of superheroes gets back together following the death of their adoptive father. Angst-filled superhero shenanigans ensue! Coming to Netflix February 15th, this series is based on the comic series written by Gerard Way who – fun fact! – was the lead singer of emo band My Chemical Romance. Don’t miss Netflix’s docuseries ‘ReMastered’ which examines some of music’s biggest unsolved mysteries. This month it’s ‘The Two Killings of Sam Cooke’ which investigates the murder of the popular American soul singer. Mr Chow from the Hangover films gets his own Netflix special. Sort of, because Korean American comedian Ken Jeong, who's a real-life doctor if you haven't heard the story, will be talking all about his choice to go from a doctor to a comedian, and all about the Hangover films in his comedy special, 'You Complete Me, Ho' (coming February 14th). 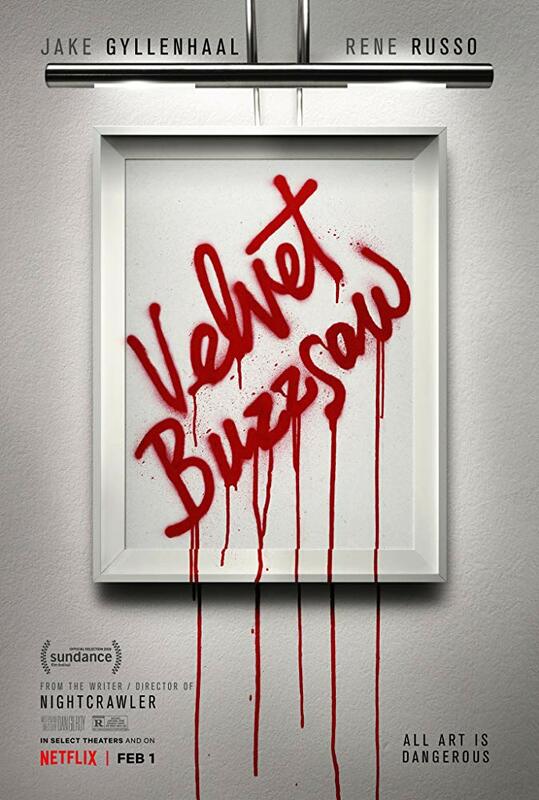 A movie gaining quite the buzz (sorry) is ‘Velvet Buzzsaw.’ Starring Jake Gyllenhaal (‘Southpaw’) as art gallery owner, Morf Vandewalt, the film is written and directed by Dan Gilroy (‘Nightcrawler’). The trouble starts when Morf acquires some mysterious paintings which, it soon becomes terrifyingly apparent, have supernatural powers that enable them to come to life, making life hell for whoever purchases them. If this sounds like a crazy premise, I would have to agree, and yet the cast boasts impressive talent including Gyllenhaal, Aussie Toni Collette, John Malkovich and Natalia Dyer (‘Stranger Things’). Arrives February 1st. If you’ve never seen the classic movie, ‘Jaws’, now is the time when it joins the Netflix stables on February 1st. Made in 1975, it may lack the cutting edge special effects we’ve become accustomed to, but it was ground-breaking movie-making at the time, earning 3 Oscar wins. Also joining the streamer in Feb is ‘Jaws 2,’ ‘Jaws 3’ and ‘Jaws: The Revenge’ but as is often the way with sequels, if they’re noted in the history books, it’s for all the wrong reasons. And check out ‘Kevin Hart’s Guide to Black History’ which sees the American comedian present re-enactments of the stories of black historical figures you’ve probably never heard of. It’s time to bid farewell to cult classic film, ‘Clerks’ (where Jay and Silent Bob began), Angelina Jolie as ‘Lara Croft: Tombraider’ and arguably the best zombie movie in the history of the world, ‘Shaun of the Dead.’ Don’t believe me, just watch! Still lots of goodies for the shortest month of the year, it seems! Here's a list of everything that's coming to the US version of Netflix in February. Content highlighted above shown in bold below.